The 10 Best Skate Parks in New York! Skate parks deliver a serious thrill, and they come in all shapes and sizes. Whether you’re into skateboarding, rollerblading, or BMX biking, inside or outside, public or private, New York has plenty of solid options. Here are the 10 best skate parks in New York State. This well-designed skate park is the East Coast’s answer to Venice skate parks. Located in the Chelsea neighborhood of New York City, the 15,000-square-foot park is new and impeccably clean, and has several rails, ledges, and an epic pool. LES Coleman Skatepark is a city park that’s free and located underneath the Manhattan Bridge—which means amazing views of the East River. Regulars love it because it has ample room to ride and it’s welcoming to skaters and spectators of every level. Located way out in Brooklyn’s Bay Ridge, Millennium Skate Park has a lot to offer, especially for bikers. It’s free and has an impressive pool with an 8.5-foot deep end, quarter pipes, and spines. Helmets and pads are required. Ithaca’s first public skate park was revamped in 2015 and is better than ever. Skaters and BMX riders alike take advantage of the ample ledges and concrete. The park is located in downtown Ithaca next to a corner store with snacks. This indoor skate park in South Glens Falls is reasonably priced at $5 per hour. It’s BMX and beginner-friendly, with lots of space and cool “street art” painted on the walls. Helmets are required. 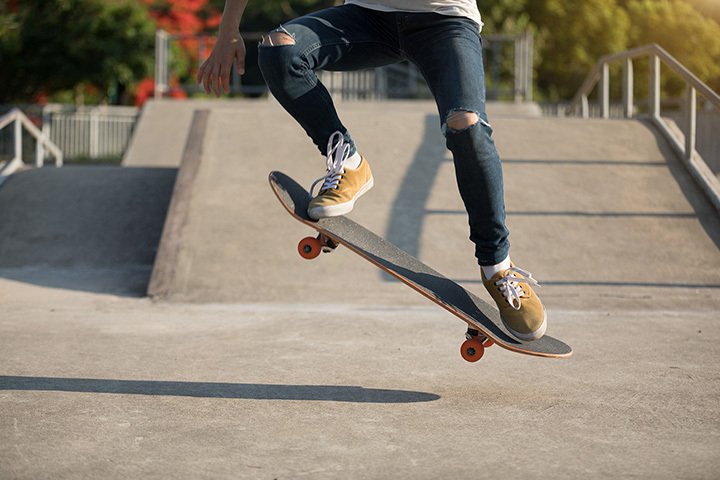 The first of its kind in the Syracuse area, Onandaga Lake Skate Park is spacious, clean, and welcoming to skateboards, scooters, roller blades, and BMX bikes. It’s an enclosed area of the park’s family activity center, featuring several ledges, bowls, spine rails, and more. Helmets are required. Long Island’s only indoor skate park features a six-foot half pipe, a 12-foot vertical ramp, and a street course, and is open to rollerblades, scooters, and skateboards. Oil City Skatepark charges $12 for a two-hour session, and they also offer private lessons and birthday parties. This spot is wildly popular with young Buffalonians. Buffalo Skate Plaza is free, clean, spacious, and open to everyone. Keep an eye on the constant improvements and expansions of the park. Designed by skateboarding legend Andy Kessler, this NYC Upper West Side skate park is one of the best areas in the city for vert skateboarding. The park currently features a 10-foot half pipe, a mini half pipe, and a quarter pipe. Discussions of a revamp are in the works. New York City’s gorgeous Hudson River Park has one more thing to brag about: a fresh new skate park designed by California Skateparks. This 8, 840-square foot space on pier 25 has plenty of rails, ramps, and walls, and is free from dawn to dusk. View more New York Skateparks.